Here we are with the 2nd SRC reveal for 2013. We have some new folks joining our group this month and I'd like to say "Welcome" to each and every one of you. I hope you have as much fun here as we do. This month I was assigned Shelby's blog The Life & Loves of Grumpy's Honeybunch. To say I was spoiled for choice would be an understatement. Shelby has so much yumminess going on over there. You should, you really should, hop on over and say "Hi" and maybe spend a few moments drooling over all the wonderful recipes she has there. "Shelby, I had the loveliest time going through your blog." When you spend a little time there, what will become evident is that family is very important to her. And I think the love she puts into her food expresses this beautifully. If you take a look at my previous SRC posts (You can check them out here), a lot of them are usually sweet. After the indulgence of the holiday season, we've been trying to watch our diet a little. So when I saw this Chili Lime Shrimp recipe that Shelby had made as part of her "Cooking Light Supper Club", I knew I was going to try it out. We don't use any cooking spray, but I tried to keep true to the "Light" aspect of this recipe and used a touch of olive oil instead. I didn't make too many changes to the recipe apart from using red onions instead of spring onions because that's what I had on hand. I also made a small portion; just enough for the two of us to nibble on and I upped the chili factor a little - we like our food hot. This little dish is an absolute cracker. I loved that the onion got a little caramelized and that just added such lovely depth of flavor. It was simple and quick to put together. Just the kind of stuff I'm constantly on the look out for :) This dish is going to make an appearance on our table every once in a while for sure. Heat a non stick skillet over medium heat. Pour in the olive oil and add the onions and saute till translucent and slightly pink in color. Add the chilli powder and stir well. 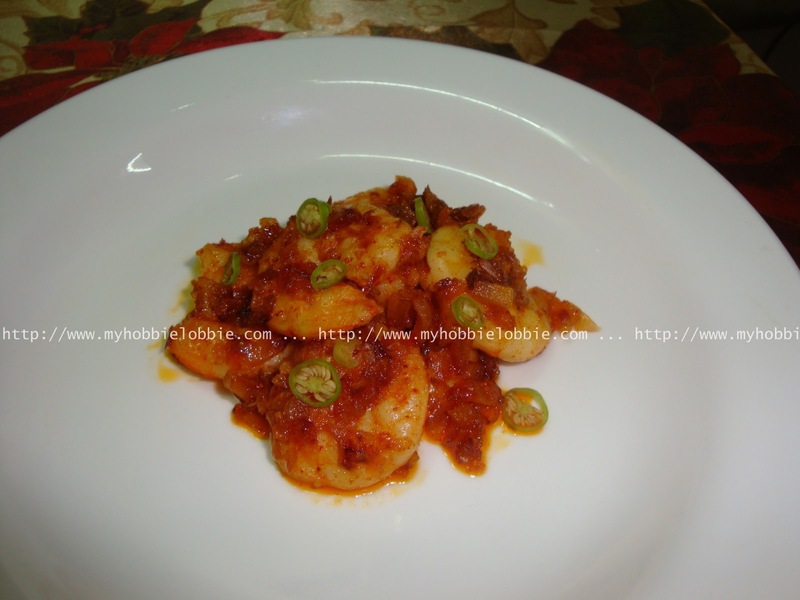 Add the shrimp and stir gently to coat with the spices and cook till done, stirring as needed. Remove from the heat and add the butter, lime and salt. Stir till the butter melts. I topped these with some finely cut green chilly. But you can garnish it with some chopped green onions or chopped coriander would be nice to. Don't forget to check out what the others have made this month. These look fantastic...spicy and delicious! Sounds like a delicious way to enjoy shrimp and I love that it's lighter than other recipes but still full of flavor. I'd love for you to check out my SRC entry Lemon Almond Biscotti. Hi Trisha! I'm happy you enjoyed going through my blog and thank you for such great compliments! Shrimp is one seafood that I actually love to cook and it so quick and easy on week nights :) Glad you enjoed the dish! Its been a real pleasure! You made a good choice. Most do baking stuff, but I look forward to seeing some savory pics in the SRC. Thanks CJ. I hope u enjoy it! Thanks for the welcome-- this chili lime shrimp looks AMAZING! Seafood is always in the rotation here. These sound nice and spicy. Thanks .... hope u like it!!! I love the idea of a chili-lime seafood combo! Looks and sounds delicious. I'd love to hear from you. Reading your wonderful comments just brightens my day! How to make Marzipan from scratch!! !